New studies show that retailers are missing out on increased revenues by not communicating the sustainability of their offer effectively. Plastics hit the headlines for the wrong reasons at the start of this year with the publication of research, which shows that we’re slowly poisoning our oceans with single-use plastics. It’s not just the obvious flotsam – plastic bags, food packaging and water bottles – which are causing the problem but also micro-granules, including those found in washing powders. It places sustainability at the top of the political and social agenda and that represents risk and opportunity for the PVC-U window industry. The PVC-U sector has stepped up its commitment to ‘go green’. According to the latest figures from Recovinyl, the industry’s recycling scheme, more than 120,392 tonnes of waste PVC-U was recovered and recycled in 2016. That’s a 12% jump on the previous year and the equivalent of more than five million window frames. It has, however, made less progress in communication this to the homeowner, something that at a time when plastic is associated in popular consciousness with the death of marine life, represents clear risk. Research suggests that it’s also a missed opportunity. A consumer study by Unilever suggesting that a third of consumers are now buying from brands based on their social and environmental impact. This means that an estimated €966 billion opportunity exists for retailers who make their sustainability credentials clear. “How we now use this recycled material is a more fundamental question. Profile performance is dependent on the strict control of its formulation and by definition, recycled material is an unknown quantity”, continues Cocken. The strategy adopted by the industry has for the most part to put this material into standalone second-grade products, for example reinforcements. 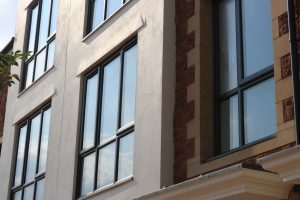 “The challenge is that where used in the substrate recyclate can have a significant impact on surface gloss and consistency of finish and because it’s ‘unknown’ and variable, it can be very difficult to control” Cocken argues. aluplast side-steps the challenges created in using recycled material by isolating it only in the core web of its product where dimensional stability is not critical. This is the approach applied to its core offer – the five chamber thermally efficient and calcium organic stabilised Ideal 70 ecotech, and Ideal 4000 systems. Two compound screw feeds then push recycled and virgin material simultaneously through the profile dye to create the profile while maintaining a distinct separation between the two. This separates and at the same time locks recycled material away from areas of the frame visible to the end-user or which perform a structural role, which means that aluplast can guarantee surface and finish quality. “Recycled content is isolated and all surfaces are manufactured from virgin material – there are no extrusion lines, there are no pits, it’s a premium finish”, says Cocken. 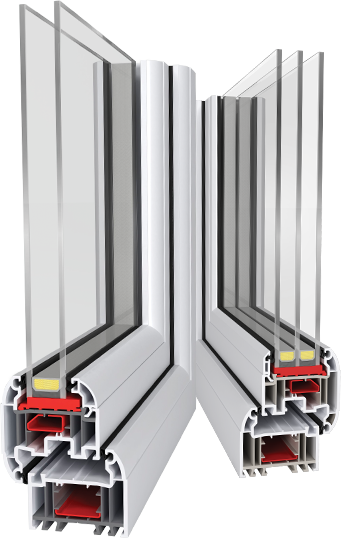 With a choice of 24mm to optimum 44mm triple glazed options, the slim line systems also easily achieves a WER A+ rating with standard components and A++with specific profiles and IGUs, . ion product can make through-life. Ideal 70 and aluplast’s contemporary Ideal 4000 delivers a very cost-effective WER A+because of the investment we have already made in its development”, adds Cocken. Processing approaching 200,000 tonnes of PVC-U globally annually, equivalent to 75 per cent of the whole UK and Irish markets combined and with its worldwide customer base manufacturing more than 10million windows per year, aluplast clearly has the scale to apply to product innovation. 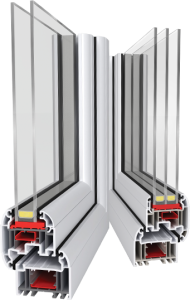 Alongside Ideal 70, aluplast has made singnificant investment into the UK market with the new Ideal 4000, contemporary SquareLine system, also exploits the ecotech process and its new Lift-and-Slide door. 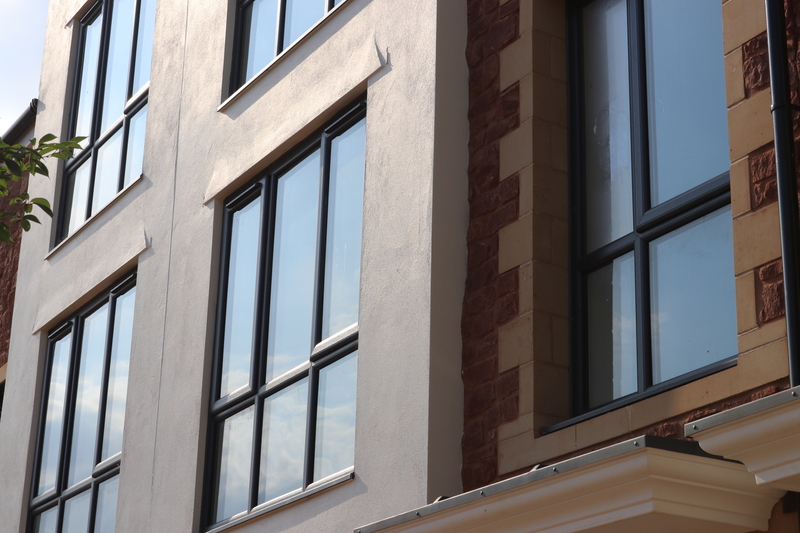 These are also available in its aluskin external aluminium fascia system. It also foils approaching 1.5million metres of product each month. That means that it holds thousands of metres of coloured profiles in stock, including two options for anthracite grey, which are available as standard within just days of orders.It also offers special foils in 15-days or less. Cocken argues that this flexibility is possible because of the investment that aluplast has made in CNC foiling technology. This eliminates the time lost in traditional foiling in manual set-up and switch over, cutting it from hours to just minutes. This has enabled aluplast to pass on the cost and efficiency benefits to its customers in a highly competitive service. This includes three smooth or ‘sanded’ finish grey options, in Basalt Grey; Anthracite Grey; and Brushed Aluminium. It has also recently added Agate Grey (RAL7038) in either a flat or woodgrain option, to both the Ideal 70 and Ideal 4000, which taps into consumer demand for warmer, finishes. “Sustainability is a key part of the story – but a part only. That’s why we continue to invest in our wider offer including additional foiling lines and CNC capacity” says Cocken. “Our proposition and commitment to the UK is clear. Our technical lead, means that we’re bringing advanced products to market at lower cost and are passing on those direct commercial advantages to our customers. “Our foil offer, ecotech, Ideal 70, Ideal 4000, Lift-and-Slide and aluskin – are exploiting the latest innovations in sustainable technologies and generating opportunity at a very accessible price point.